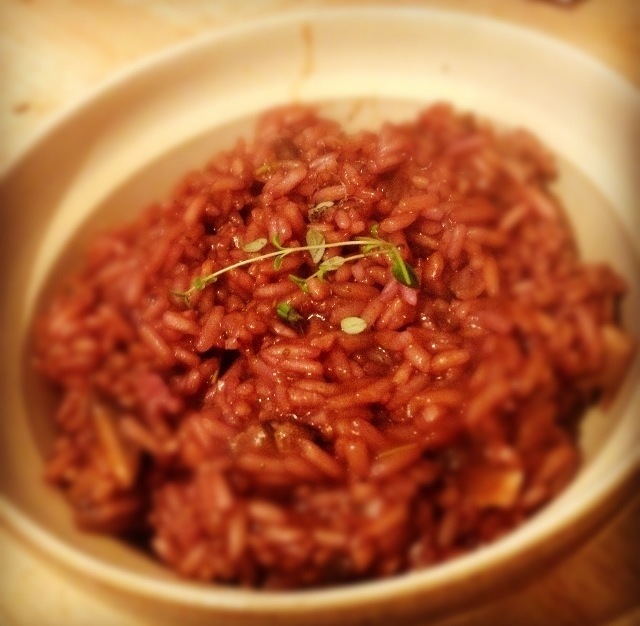 Earthy Red Wine & Mushroom Risotto, Serves One. 36p. Heat a teaspoon of oil in a small frying pan, the one I used was 20cm across but I was only cooking for me! Peel and finely slice the garlic and add to the pan. Chop the mushrooms into small chunks and add to the pan. Shake the herbs over and allow to cook together for a few minutes. Add the rice, and stir to coat in the oil. When the rice starts to turn translucent, add the wine and tomato purée, stirring constantly to prevent any of the rice sticking to the pan. When the wine is almost all absorbed, start to add the stock, a ladle at a time. Stir in until almost all absorbed, and repeat until either the stock is gone or the rice is cooked. Add some additional herbs to taste and serve with crusty bread if you wish. I occasionally cook something I call risotto, but actually generally turns out as fried mush. Will try this as a substitute – thanks! I tried this recipe tonight and it was gorgeous! I often make a mushroom risotto, but the addition of the wine and tomato puree lifted it to something very special. Thanks for the recipe. I tried this tonight and it was gorgeous. I often fall back on my plain ordinary mushroom risotto, but the wine and tomato puree lifted it from just tasty to something really special. Thanks for the recipe. Hope your cold will soon be better. I have used white wine in rissottos last few years but will give red a go. I love red wine in cooking also fab in lasagne, pasta sauce or casserole dishes really noticed the basic red increase in price.Thanks for another fab recipe hoping your recipes help me keep to low food budget for april. Just discovered your blog and I love it! Your recipes are saving my bank balance one day at a time! Thank you. Just by way of some info – Red Wine used to be fairly common in risottos – in one of Mr Oliver’s first books there is a recipe for one if I remember correctly. Glad to see you bringing it back! Anyway – thank you once again! You didn’t put a quanity of tomato puree, so being a typical bloke I gave it a good squirt. Woops, a little intense. I know this would be tasty without my stupidity. 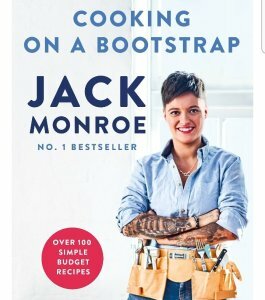 Looking forward to a book, I hope the ingrediants from one day can be used on the next etc. This was delicious. Just made this when I got in from work, added herbs from the garden, and I scoffed the lot! Thanks. Stuff MrO (wonder what he’d taste like) – everything tending to be seasonal, red wine risotto is quite common for a while in the winter here in northern Italy, using radicchio and red onion as the veg – cheap as chips here but I doubt it counts as a bargain in the UK. It’s a bit like Delia suggesting her idea of doing a “risotto” in the oven – been done for generations here but don’t call it “risotto”. Enjoying your site Jack. I was directed here today for your ATOS article (brilliant and to the point) someone else had mentioned your food on a budget blog while I was at work (and unable to access your site due to the firewall). Delighted to have a peek at your recipes and will try this one tonight, all I need are a few mushrooms as I have the other I gradients. Many thanks. This looks amazing! 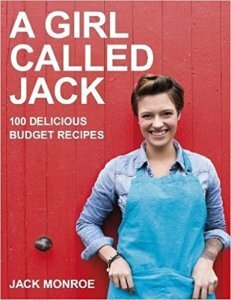 Thank you for writing up such good, sensible, frugal recipes: you’re an inspiration. My tip for a risotto is, rather than using wine as a base, to use Vermouth: it keeps for absolutely ages, and a 1L bottle in Aldi is, I think, £3.99. I tend to use the extra-dry sort as a standard risotto base, but I know my mum has used the red kind in stews etc in place of sherry/wine/port/other more expensive alcohol. Just made this and it was absolutely beautiful. I’ve tried a few of the websites with recipes for cheap food and they were either too bland, not nutritious or too time consuming. This was perfect – cheap, nutritious, flavourful and quick to make. Role on the carrot, cumin and kidney bean burgers! Sounds like a great recipe, however I noticed that quite a few of your recipes use wine for flavoring. I was wondering if you knew of an alcohol free substitute for wine. Would ordinary grape juice do? We do a red-wine-and-stock based beet risotto. Some of the beets are shredded, some are in bite-sized chunks. Wonderful color and lovely with a dollop of horseradish sauce on a cold night. Just made it with basmati, because that’s what I had on the shelf. Used 250g of mushrooms and rice, but only needed 800ml of stock. Amazed no onion was needed. I think is would work well with long grain rice too. Delicious! 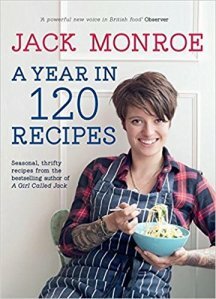 My small boy won’t eat mushrooms Jack, what could I substitute with please? I forgot to say that I added some finely shredded ‘greens’ or, as they would say in Greece ‘horta’. Beautiful colour and texture.